Watches & Timepieces > Elegant Timepieces. 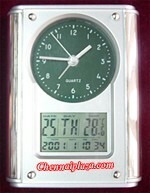 Item Description Cute looking dual display clock having analog as well as digital display with date and temperature. Item Description Lovely looking circular designer digital display based clock with leather decoration offering alarm, date and temperature details with a stand to hold your regular accessories. 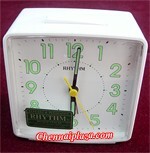 Item Description Elegant and innovative looking white Rhythm analog clock is the traditional alarm clock offering radium display for night viewing and a long lasting quality. 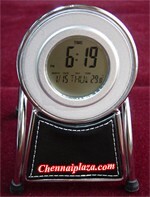 Item Description Elegant and innovative looking black Rhythm analog clock is the traditional alarm clock offering radium display for night viewing and offers rich look overall.